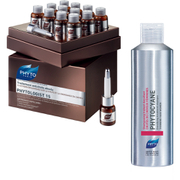 Rediscover thicker, healthier hair and radiant skin with the men's Phytologist 15 Anti-Hair Loss Bundle from Phyto. The set combines a range of innovative products designed to promote healthier hair, nails and skin; it’s perfect for those craving radiance and a vitality boost. 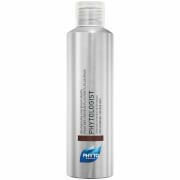 A one month supply of anti-hair loss treatment that performs 15 biologic actions to work on the loss and growth of hair. Combines 99% natural ingredients, including: Cacao extracts, which fight against micro-irritations of the scalp; Baikal skullcap, which works to generate thicker hair; Indian Gentian, which activates growth and favours the development of new hair; and Vegetable Stem Cells, which protects the scalp from external aggressors. 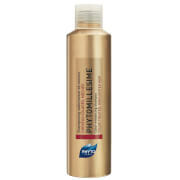 Apply after shampooing and leave to melt into the scalp, for denser, stronger and healthier hair. This strengthening shampoo works to fortify the hair bulb whilst energising and revitalising the scalp. Harnessing the stimulating properties of rooibos extract, and a host of vitamins and restorative ingredients, the formula expertly restores density and replenishes strength and resilience so hair feels healthy and energised. Prepares hair to receive scalp treatment. A dietary supplement that promotes healthier hair, nails and skin. Infused with a host of natural vitamins, fatty acids and antioxidants, the nutritional supplement helps create the appearance of fuller, thicker, shinier hair; stronger, longer nails; and radiant, illuminated skin. Two capsules a day will help promote a stronger, healthier you. It also helps fortify and lengthen lashes. A balancing, fortifying and universal scalp treatment that works to fortify hair, relive a flaky scalp and improve the efficacy of hair loss treatments. Combining rosemary, sage and eucalyptus with cypress and lemon, the balancing formula purifies the scalp and supports natural micro-circulation to create a healthy environment for hair growth. Perfect for dry, oily, itchy and irritated scalps, the refreshing treatment helps deter dandruff and is the ideal prep for thinning hair treatments. For an intensive treatment, leave on hair to work overnight. Do not use five days prior to or after a chemical process. Hair Loss Treatment: Equisetum Arvense Extract (Extraction de Prêle), Alcohol Denat. (Alcool de Betterave), Aqua/Water/Eau (Constitutive des Matières Premières), Propanediol, Glycerin, Citrus Limon (Lemon) Peel Oil (Citron), Globularia Cordifolia Callus Culture Extract, Arginine, Lactic Acid, Parfum/Fragrance, Serenoa Serrulata Fruit Extract (Serenoa Repens), Glycine Soja (Soybean) Germ Extract, Triticum Vulgare (Wheat) Germ Extract, PVP, Salvia Officinalis (Sage) Oil (Sauge), Theobroma Cacao (Cocoa) Extract, Cupressus Sempervirens Leaf/Nut/Stem Oil (Cyprès), Lentinus Edodes Extract (Shitaké), Melaleuca Leucadendron Cajaput Oil (Cajeput), Scutellaria Baicalensis Root Extract, Panthenol, Pyridoxine HCL, Rosmarinus Officinalis (Rosemary) Leaf Oil (Romarin), Swertia Chirata Extract, Maltodextrin, Cananga Odorata Flower Oil (Ylang-Ylang), Limonene, Linalool, Citral, Benzyl Benzoate, Geraniol, Benzyl Salicylate, Farnesol, Gluconolactone, Hydroxypropyl Chitosan, Sodium Benzoate, Potassium Sorbate, Dextran, Trifluoroacetyl Tripeptide-2, Calcium Gluconate. Hair Supplement: Gelatin, Carrot Oil In Sunflower Oil With Rosmary Extract, Acerola Extract Enriched with Vitamin C, Glycerin, Borage Seed Oil at 20% GLA, Hydrogenated Soybean Oil, Fish Oil, Rice Bran Oil, L-Alpha Tocopheryl Acetate, Yeast, Wheat Germ Oil, Calcium Pantothenate, Soybean Lecithin (Gluten), Orizanol, Pyridoxine Chlorhydrate, Riboflavine, Biotin, Colors: E 171,E 172, Cereal Flavor. Scalp Treatment: Corn Germ Oil, Fragrance, Citrus Lemon Peel Oil, Limonene, Melaleuca Leucadendron Cajaput Oil, Rosemary Leaf Oil, Sage Oil, Cupressus Sempervirens Leaf/Nut/Stem Oil, Linalool, Citral, Isoeugenol, Geraniol, Eugenol, Coumarin, Citronellol.